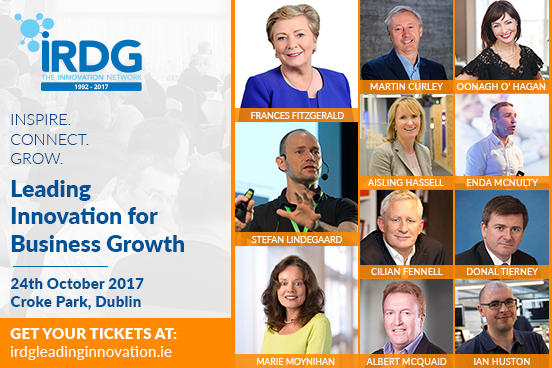 The line-up is now fully announced for our 25 Year Special “Leading Innovation for Business Growth” Conference on 24th October, and we are looking forward to hosting companies from all sectors of industry, and all corners of the country. This year’s insights will be extremely valuable for CEOs, Executives and Leaders in all functions who are responsible for growing their business through innovation. The themes are all about Leadership; equipping you to lead and inspire your organisation’s people to persist with innovation, on what can often be a very challenging path. On the day, we will also be presenting each of the 9 founding IRDG companies (Glen Dimplex, Diageo, Kerry Group, Bimeda Holdings, Henkel, Moog, Analog Devices, Bord na Mona and Stryker) with an Innovation Recognition Award for their services to IRDG and Irish business over the past 25 years. Get a flavour of the 2016 IRDG Innovation Network Conference on this link.